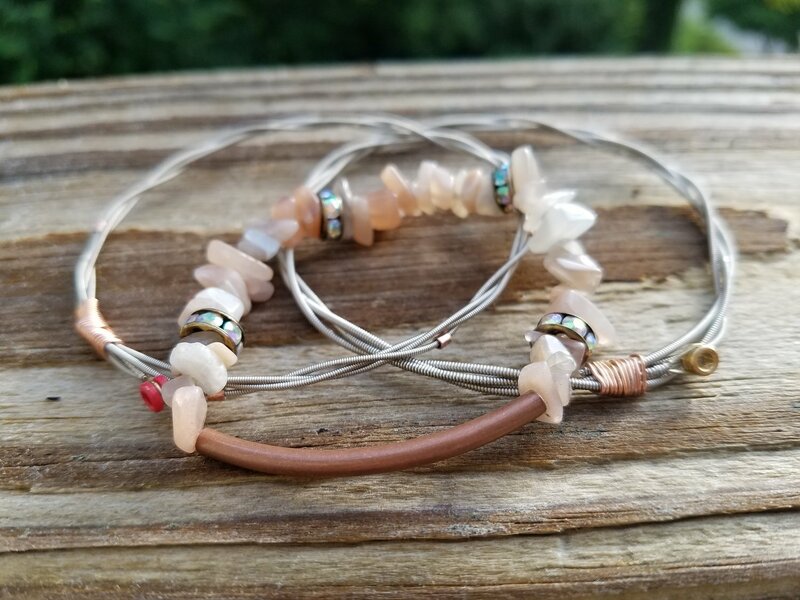 Moonstone Bangle Set includes two bangles design created from one of Trevor Finlay guitar strings and an Moonstone bracelet. Bangles are approximately 8 1/2" circumference, bracelet is created on stretchy band. MOONSTONE~ The Moonstone crystal meaning is associated with the inner goddess, a symbol of fertility and sensuality. The life-giving feminine figure is an empowering visualization that gives us the gift of increased intuition, the perfect prescription for cleansing the mind of negative emotions holding you back. Fear? Shrug it off. Self-doubt? You got this. With the Moonstone crystal by your side, channel its healing powers with daily mediation, a practice that helps to clear the mind and center the spirit.